Trixie received an acrylic paint set from a school friend for her fifth birthday back in February, and she’s been chomping at the bit to use it. The kit is something like this. All I could see were acrylic paints waiting to be spilled on the carpet, sofa and just about anywhere else they shouldn’t be at Fancy Pants Ranch, so I made excuse after excuse to put off creating her masterpiece. Except, last weekend I ran out of excuses. We’d already been on an arts and crafts bender, making a homemade dollhouse on Saturday. When Sunday rolled around, it was go time. I reluctantly took the kit out of its hiding place and set up a paper-covered art zone for her to work on her creation. I had to help her get the paints open and onto a makeshift palette, but she did the rest. Here’s the finished product, two dogs on a sunny day. 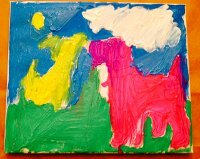 I admire her bold use of color and abstract interpretation of both dogs and clouds. P.S. This didn’t turn out to be a mess at all! So much worrying for nothing. 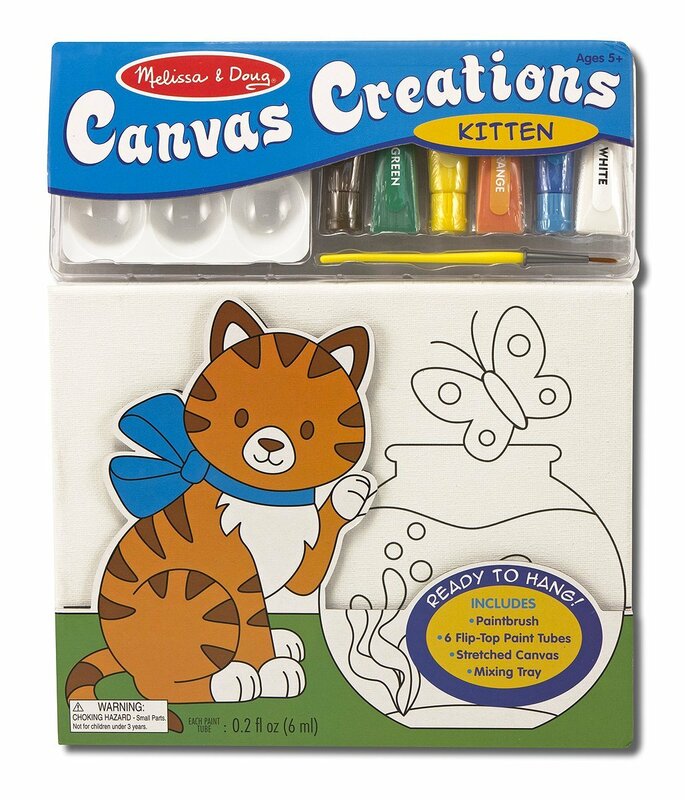 But I still won’t be bringing acrylic paints home any time soon. I will take a signed copy please. I will pay in gluten free cupcakes along with a princess party for the three of us. you think I am being silly, but I am 100% in need of a good princess party. Plus some good artwork for my walls. Then you should also check out my earlier post of the Picasso-esque creation we won (and by that, I mean we paid for) at the school’s silent auction.